THE PREPARED TABLE premiered on November 11, 2015 as an alternative Veterans Day event at the Bellevue Club, in Oakland, California. It was one day before the terrorist attacks in Paris. Looking back, it feels that in some small way we were able to create an island of sanity in a world gone made—a least for a few moments. As imperfect as it is, the San Francisco Bay Area is a safe harbor for all of our multicultural identities, including the Iraqis, Afghans and military veterans who so generously agreed to be interviewed, and who were present at The Prepared Table. A Taste of the Prepared Table from the live event. The core of THE PREPARED TABLE is the extraordinary people who have shared their stories for this work. Below are excerpts from three interviews. We have prepared a table before you with delicacies from three countries: Afghanistan, Iraq, and America... It is time for our main course, Kabuli Palau, Afghanistan’s national dish: chicken thighs cooked over a bed of golden brown onions & Basmati rice...and slow-roasted over three decades of war. Spiced with the threat of the Taliban pulling you out of school to fight, charbroiled on skewers. Pairs nicely with our pomegranate juice from the Valley of the Gods. Fazal Ahmadyar began performing Afghan folk songs that he learned from his family in Kabul Afghanistan. He has played with such musicians as Zahir Howaida, Kabir Howaida and Ahmad Zahir. He attended Kabul University to study medicine, but decided to continue playing music and in 1970, immigrated to the U.S. to study music and drama. He is a singer-songwriter and composer of Afghan music for harmonium. Krystle Ahmadyar is a vocalist, composer, dancer, and artist. Her music is rooted in her Afghan and Mexican ancestral traditions of storytelling and song. She shares stories of love, resiliency, and oppression through music and movement. She studies Afghan music with her father, jazz vocals with Molly Holm, and studied experimental music at Mills College. Jenay "ShinobiJaxx" Anolin an Oakland native, is an independent dance performer, nutrition educator, choreographer, mentor and movement coach, who is versed in Ballet, Hip Hop, House, Waacking and other street dance styles. She has a A.S. degree in Nutrition and Dietetics and a B.A. in Dance and Cultural Studies from UCLA with a minor in child development. Rose Armin-Hoiland collaborates and performs with some of the finest jazz musicians in the Bay Area, including the illustrious pianist Dan Zemelman, and Grammy-winning violinist Mads Tolling. Rose is also the vocalist for Albert Greenberg’s Lost American Jazz Book concert series and album, which won "Jazz Vocal Album of the Year" from the 14th Annual Independent Music Awards. She can also be found making joyful noise with the Oakland Interfaith Gospel Choir. Sheldon Brown, composer and woodwind artist has been active on the Bay Area music scene for over 25 years, leading his own groups and playing in some of the most interesting and creative ensembles in the Bay Area and beyond. In 2013 he received grants from Chamber Music America and San Francisco Friends of Chamber Music to compose Blood of the Air, an extended composition based on the speech melodies and poetry of Beat-era Surrealist poet Philip Lamantia. Blood of the Air premiered at the 32nd Annual San Francisco Jazz Festival in June of 2014. Brown has been a key member of Clarinet Thing (led by Beth Custer), since 1991. Tawfic N. Halaby, the eldest of five children, was born in Kuwait to a Palestinian father and an American mother. He participated in musicals and played the trumpet while attending expatriate British and American schools in Saudi Arabia. Tawfic is a member of the World Harmony Chorus, and traveled to Cuba with the chorus on a cultural exchange that culminated in an international choral festival in Santiago de Cuba. Said Hashemi is a percussionist who has been studying tabla and playing concerts since 1982, first studying classical Indian tabla and later with Ustad Asif. He plays tabla, dhol, doira, congas, shoulder drum and jazz drums. He was born in Kabul. In 1992, while attending medical school, he fled Afghanistan to escape the war. He has played with numerous Afghan and American musicians, and has also played music for the U.S. military training center. 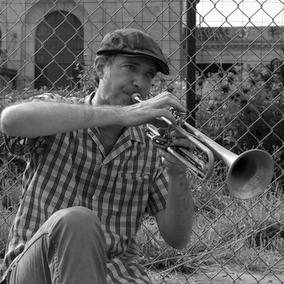 Darrin Johnston, a Canada born trumpeter, composer and songwriter, has collaborated and recorded with an extremely diverse cross-section of artists. His interests rotate around composing instrumental music, writing songs, and performing all styles of jazz, experimental and purely improvised music, as well as traditional music of the Balkans, Greece, Macedonia, Turkey, and the Arab world. Johnston has a BA from the Cincinnati Conservatory of music, and an MFA in composition from Mills College. Maya Kronfeld is a rhythm-driven piano player and keyboardist. Born in Berkeley, California to Israeli parents, she has been heard in venues ranging from Lincoln Center in New York to the Viper Room in Los Angeles. The Maya Kronfeld Trio, an original jazz project, was recently featured on KCSM. Rogelio Landaverde has been in the mix of performing as a musician and actor. This is his first time working with Black Swan Arts and Media. Thank you for joining us on this journey of masks, family and food. Enjoy. Amy Prosser has performed with the Denver Center, Geva, Hamptons Shakespeare Festival, Magic Theatre, TheatreWorks, Sacramento Theatre Company, PCPA Theaterfest, Capital Stage, foolsFURY, Ashland New Plays Festival, and Bay Area Playwrights Festival. She is a graduate of the A.C.T. Summer Training Congress, earned her BA in English and Russian at University of California, Berkeley, and has an MFA in Acting from the National Theatre Conservatory. THE PREPARED TABLE invites the guests to enter the stories through two 12 foot by 9 foot video screens on which the interviews are projected. THE PREPARED TABLE was developed by Helen Stoltzfus (director) and Albert Greenberg (music supervisor, sound design, video editor). They have been collaborating on the development of original performance works for three decades. To learn more about Helen Stoltzfus and Albert Greenberg see ARTISTIC DIRECTORS. Ian Winters is an award-winning video and media artist working at the intersection of performance and time-based visual media to explore the relationships between physicality, technology, and place. He studied video & performance at SMFA-Boston and Tufts University, w/ post-graduate training in architecture and dance. Recent awards include 2013 residencies at Djerassi, Earthdance, Nexmap/CNM, 2013 ISEA-Sydney, ISEA 2014, a 2012 Leonardo LASER presenter, the 2012 and 2014 LAD prize for video design, 2012-3 Isadora Duncan Award nominations for best visual design. His work (either solo or as a major designer) has been seen at many venues including Yerba Buena Center for the Arts, Zero1 San Jose, ODC, Z-Space, The Asian Art Museum-SF, The Kitchen, EMPAC, London City University, the Port of Oakland, Attenborough Centre for the Arts (Sussex University), The Luggage Store, Moscow Conservatory Electro-acoustic Center, Journées de l'électroacoustique: Paris, Mass Art, London Cutting Edge Festival. Recent video and media design collaborations include work with Robert Moses Kin, Francis Ford Coppola, Black Swan Arts & Media, Chitresh Das, Pamela Z, and Evelyn Ficarra.